T3 Trainspotting Tiree from jack lockhart on Vimeo. We live very remotely in a small community, screening films enables the community to come together and exposes them to different worlds, cultures and ideas. This project has also provided the opportunity for young people to learn new skills and share experiences. Jen Skinner started the project with the support of the Tiree Community Development Trust who helped with a bid into the Health and Wellbeing Fund. This enabled us to have some money for room hire, workshop materials and staff time. Due to the state of the equipment in the cattle market (the projector was very old and there was no screen) the screenings began as a Film Club via Into Film and were aimed solely at young people aged 5 – 19 years old. This was fantastic as it enabled us to build an audience and take risks with programming without the film hire costs. There are approximately 100 children on the island of school age, with the secondary only having 24 students, using Film Club meant that we could put a (15) certificated film on even though there were only 10 young people of that age who could come and see it. Through running regular screenings and proving a need we applied to the BFI Neighbourhood Fund and were successful in a bid for new equipment. Without the BFI Neighbourhood Fund we would not have developed our screenings from the Film Club we ran via Into Film to our community cinema, Screen Tiree. Through setting up our Community Cinema we have formed a committee which includes two young people, one aged 11 and one aged 24 years old. We still run the Film Club as well as screening family films through the community cinema and have plans to develop these further by forming a group of young film programmers to take ownership of Film Club. We have moved the cinema from the Rural Centre to the community hall, An Talla, which is much more accessible and comfortable. Becoming a Community Cinema enabled us to join Film Hub Scotland and received support from them, including funding to start our group of Young Film Programmers and support to take part in training and networking. We celebrate the shared experience by building an audience and interest in a culturally diverse programme and engaging them with activities, talks and other forms of participation. This year we screened both I, Daniel Blake and Moonlight before their DVD release. The venue is accessible to all and we regularly work with different community groups to deliver targeted screenings. We recently worked in partnership with Cùram, a group who works with older people in the community, they ran a café and we screened When Marnie Was There, to an audience young and old. For Halloween we worked with the local youth club and screened Ghostbusters followed by a Halloween party. We have run mini festivals thanks to support from Into Film and the local school. The aim of the project was to celebrate film and the shared experience of cinema, bringing together communities from Tiree and beyond. Connecting people with the wider world and inspiring them. We provide valuable film experiences to a remote rural population. We support young people and children to watch film in a cinema environment, and have successfully exposed them to different worlds, cultures and ideas. We're bold and take risks with our programming, and build engagement with film through activities, talks and other forms of participation. We work with a multitude of different community groups and have broad networks - we have connected people through our work. We have given our young people an opportunity to learn about the craft of filmmaking, and enthused them to be ambitious. We have had 30 screenings. Over 1500 instances of participation in the project including those who have attended screenings, workshops and sessions at the school. An average audience of 38 per screening. A successful bid for new cinema kit from the BFI Neighbourhood Fund has vastly increased the quality of what we do. We received funding from Tiree Community Development Trust to purchase iPads for the young people to make their own films and screen them. This led to Into Film running a film roadshow on Tiree in 2016, both in school and out. They paid for pupils from Coll Primary to come and stay on Tiree and take part for two days alongside the pupils from Tiree High School. This year we received funding from Into Film to run Animated Tiree, building on the success of the Roadshow the year before. Where we delivered workshops and screenings in school and out with a special visit from Jim Parkyn from Aardman, he worked in school for a day, introduced the public screenings and ran a Morph making workshop for adults. We have received funding through Film Hub Scotland’s Atomic Fund to develop a young film programmers group and are working with Regional Screen Scotland on developing this network across Argyll, bringing young people together. Into Film sent a film crew from Working Title Films to film our Film Club for the BFI end of year report. Films for children have included: Sing Along Frozen, Ghostbusters, My Neighbour Totoro, Ponyo, BMX Bandits, Riding Giants, Song of the Sea, Zarafa, Fantastic Mr Fox, The Princess Bride, Labyrinth, Artic Tale, Willy Wonka and the Chocolate Factory, Discovery Film Festival Shorts, BFG, Get Santa, Kubo and the Two Strings, Hunt For The Wilderpeople, The Wrong Trousers, The Farmer Llamas, When Marnie Was There, Trolls. Films for adults started in September 2016 and have included: The Power in Our Hands, The Magnificent Seven (1960), I, Daniel Blake, Moonlight, La La Land, T2 Trainspotting as well as archive films from An Iodhlann. Box Office Revenue and confectionary sales cover most of the screening costs. Atomic Fund £1000 – project ongoing focusing on developing our young audiences. Health and Wellbeing Fund £1000 to initially start the project. BFI Neighbourhood Fund – new screening equipment. Tiree Community Development Trust £1600 – for filmmaking equipment. Into Film have supported us to deliver two mini film festivals. Animated Tiree worked well, as we had some funding we were able to plan a full week’s activity which involved the whole community. Animation workshops took place at all of the after-school clubs and we had a day in school with Jim Parkyn from Aardman. He worked with every child in school as well as running a Morph-making session for adults and introducing two of Aardman’s films. 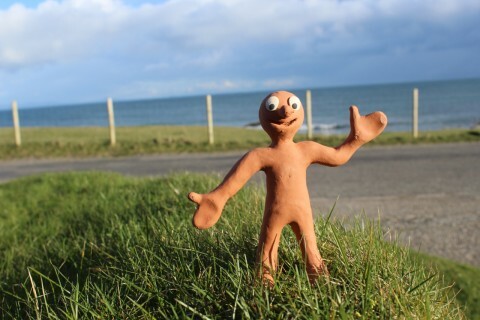 Through this project and working with the pupils at the school, most of whom brought home their own Morph, we created a fantastic buzz and engaged with members of the community we hadn’t before. Most of our work relies on people giving their time and energy for free, this means there can be gaps in the activity. Building the adult audience and programme requires more resources, we consistently get an average of 20 admissions for the adult screenings (which only just covers the film hire). Without regular adult screenings and more time spent engaging the whole community it will be difficult to make this sustainable in the longer term. Find funding to launch the adult programme properly as a 3 month programme. Enabling us to build audiences, plan and market and engage the whole community. Share and discuss all kinds of film. It has exposed them to new ideas from other countries and cultures and extended their awareness of genres. To think about future careers – through meeting people from industry. To meet new people from neighboring islands. To be creative, learn new practical skills, including filmmaking, giving them the tools to communicate their ideas through film. This project has reached a vast audience both across the UK and internationally. Our work has been shared in cinemas via the short film Into Film made about Screen Tiree. Our homage to T2 Trainspotting went viral, with over 10,000 views on Vimeo and press coverage, as well as screenings at festivals both in the UK and Europe. Engaged audiences through films from around the world. Given audiences access to national opportunities, incentives and networks. Connected young people in rural areas. Created a group of Young Film Programmers who can work together and build links across Argyll. Increased their confidence and enabled them to have a voice. Given them the opportunity to socialise within their community. Fostered their interest in film and enabled them to share ideas and experiences. We are developing a group of Young Film Programmers who can support our film activity here on Tiree. We have involved young people on Tiree in national opportunities and programmes. Trained young people with transferrable skills. Widened experience through exposure to different films and cultures on screen. Increased confidence and broaden ideas on possible future careers. Established closer links with local venues and communities. Given young people their first experience of cinema. We made a homage to Trainspotting to promote our screening of T2 Trainspotting, this reached over 10,000 people on Vimeo and resulted in reports on Heart Radio and The Scottish Sun, with Irvine Welsh tweeting that he loved it. It will be screened as part of Edinburgh Short Film festival and is touring Scotland as part of CineMor 77’s programme. It was also screened recently at the Europa Cinema’s Audience Development Lab in Bologna.